Create direct-to-consumer relationships with Bond Brand Loyalty’s mobile loyalty solution. 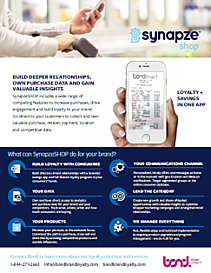 SynapzeSHOP collects powerful purchase data and insights with a suite of class-leading features, including mobile loyalty program management, offers, coupons and rebates, and an easy-to-use receipt scanning tool that allows your customers to shop, scan and save money. Download your free data sheet and learn more about SynapzeSHOP.